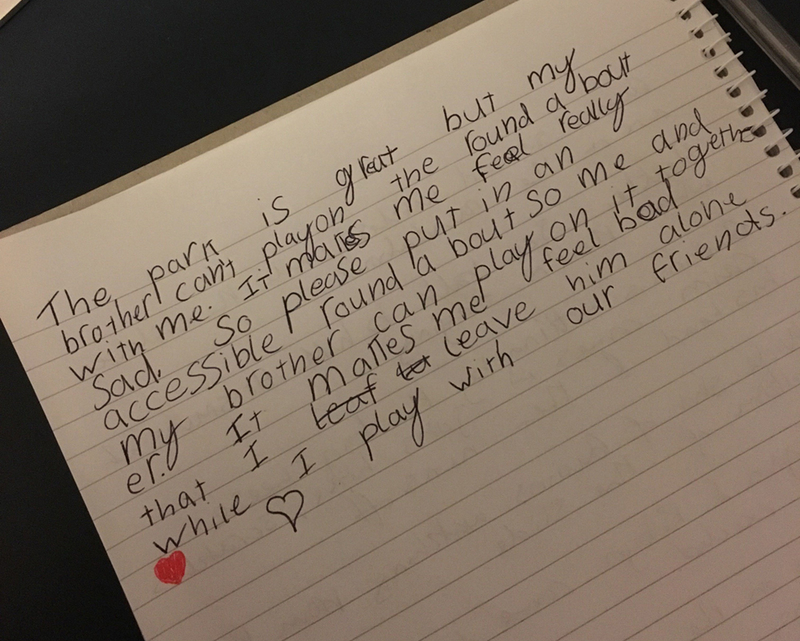 We are raising money to buy accessible play equipment to make our local play park more inclusive where children can ALL PLAY TOGETHER. I am mum to 3-year-old Quinns. He is a sociable, thrill seeker of a little boy. He loves to play with his friends and he absolutely loves the swing in the play park. He has quadriplegic cerebral palsy so he can’t yet sit unaided and he’s not using words to talk yet. He’s learning to communicate by operating a computer with his eyes. He’s an amazing little boy! We currently adapt a 'baby' swing for him in our local play park but he is getting too big for it. I already can’t manage to get him in and out of the seat without some help. Soon there will be no equipment suitable for him. He won't be able to sit on the standard swings and the basket swing is only ok if his sister, Anita sits on it with him. Really there’s nothing else for him in the park. He spends an awful lot of time sitting watching everyone else play. This makes us all very sad. We’ve done our research. There’s nothing in the Stirling area at the moment although Kings Park has got funding and will be getting some accessible equipment later this year. We’ve travelled far and wide in search of great play but we really want to be able to nip into the park on our way home from school. We want to make the park into a great place that is fun for all children no matter their ability. We are raising money for new play equipment so that Quinns and his friends can ALL PLAY TOGETHER. We want to buy an accessible roundabout so that we can wheel his supported buggy onto it, then he can play with the other children. 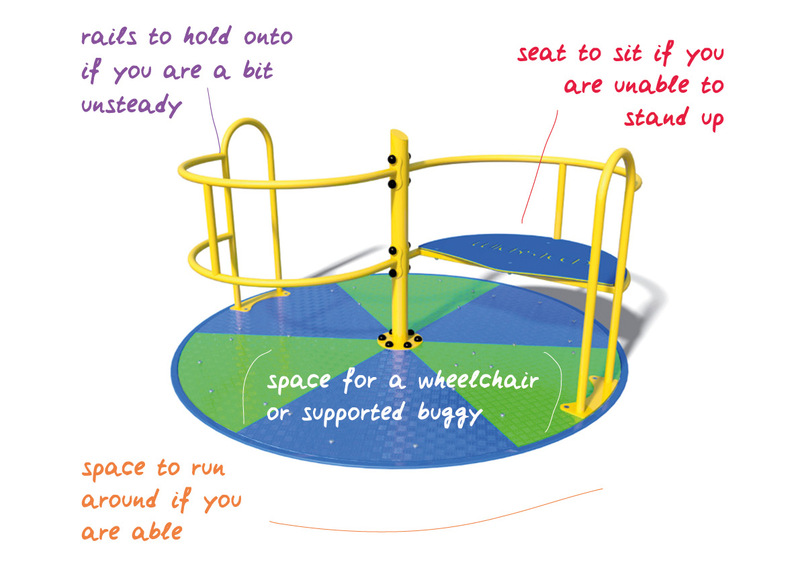 This one piece of equipment has benefits for children of all abilities. We would also like a boat style swing that would be easier to adapt for him to keep him swinging for longer. In order to make the most of the fabulous sand pit already in the park it would be great to have a sand table. A simple table would enable the children to play at Quinns' level whether that's with the sand, toys we've brought from home or stones they found around the park. As well as the equipment we will also need to resurface part of the park. The current bark isn't ideal for moving around the park so we need a new surface that allows easy movement for buggies (supported or otherwise) and wheelchairs onto an accessible roundabout.  The Community Council has provided some money towards our campaign, and we are in the process of making various funding applications, but we need more and with your support we can make this happen and quickly. This campaign isn't just about Quinns. Of course we want to get the equipment in place as quickly as possible so he will benefit from it but it will also leave a lasting inclusive play park for many families to come. At the moment we have to travel to play on an accessible roundabout. 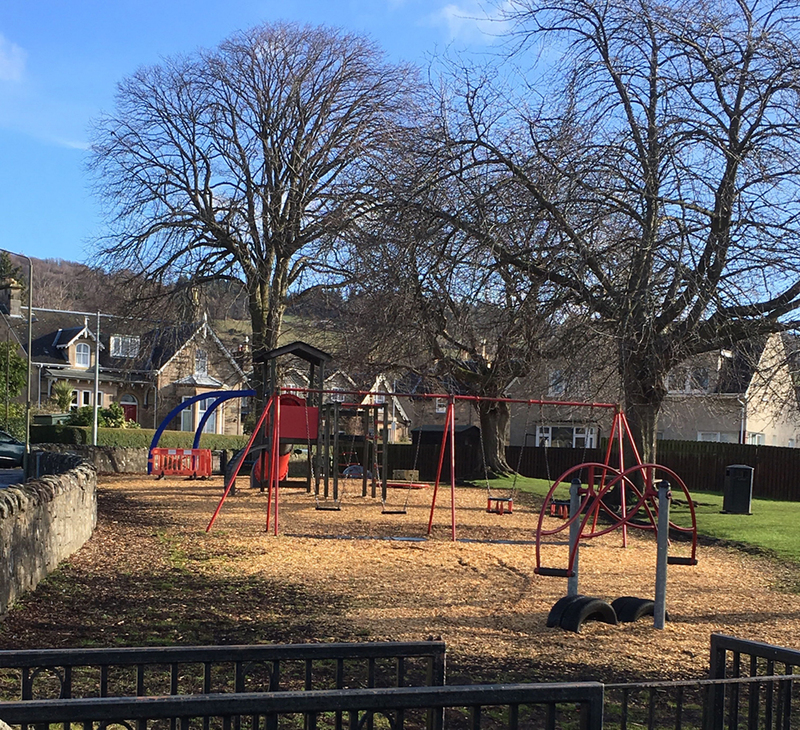 If we can transform our play park in Bridge of Allan, there will be many families from near and far, who will also be willing to travel to Bridge of Allan to enjoy our new play park, and everything else that the village has to offer. Please support us by giving a donation if you can and if not please tell everyone you know in case they can.